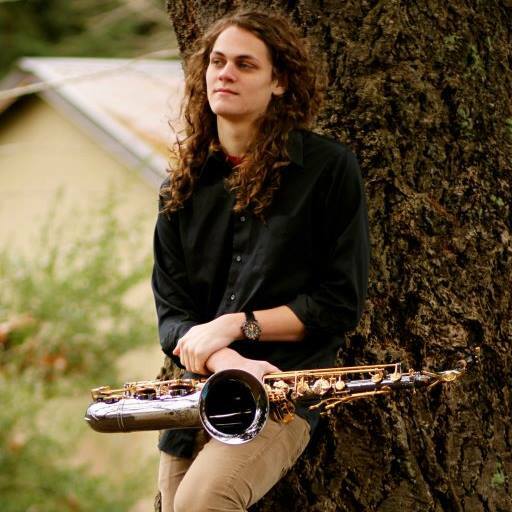 Joel received his degree in saxophone performance from Portland State University. During his undergrad career, Joel studied with many instructors for several instruments including George Colligan, Kerry Politzer, Yoko Miyama, and Loretta Keizer for piano; Rob Scheps, John Gross, Gary Harris, David Evans, Clark Bondy, David Valdez, and John Nastos for saxophone; Dr. Sydney Carlson, Gary Harris, David Evans, and David Valdez for flute; and Neal Grandstaff, Jack Hopfinger, and Erik Crew for guitar. Other professors of music taught Joel various music related disciplines such as theory, history, composition, arranging, ear training, aural skills, and repertoire studies. These professors include Lars Campbell, Charlie Grey, Charlie Doggett, Tom Wakeling, Kevin Deitz, Darrell Grant, Derrick Sims, Dave Mills, and Dave Fleschner. Alongside his collegiate studies, Joel also received instruction from the Alan Jones Academy of Music. His tuition was waived by earning a scholarship for inscribing Jones’ music into music notation software. Joel has his own musical group known as The Joel Stevens Quartet but he is not limited to performances with just these members. Joel has been a sideman for many groups spanning over various genres including Tristan Selzier’s Jazz Syndicate, Hot Tea Cold, Space Leach, DTW, The Neal Stadley Group, The Dan Hess Blues Band, and The Hank Will Quartet as well as many others. Joel’s philosophy on music teaching reflects his own history. Joel started music late in comparison to his peers thus having to work very hard to overcome the time lost from the lack of practice before going into music school. Joel played some guitar and saxophone in high school; however, his abilities were extremely limited showing zero promise or skill until later in his college career. He strongly believes that if he can do it anyone can and that talent is nothing more than a pursued passion. Utilizing the variety of teaching methods Joel witnessed firsthand from his many music teachers, he can accurately assess the needs of almost any student, young or old, and put them on a path to success. This entry was posted in Bass, Flute, Guitar, instructors, Piano, Saxophone, Ukulele on January 3, 2018 by Jake Zender. What brands of ukulele do you carry?